You must make reservations at least 5 minutes in advance of the time at Gloria's Latin Cuisine - Fort Worth. Gloria's - known for their flavor full tasty food. a hand-made tamale wrapped and steamed in banana leaves, gently spiced and filled with chicken, chunks of potatoes, sweet pepper and tiny bits of tomatoes. a hearty chicken soup with lots of vegetables, big chunks of chicken and rice very healthy. (thur-sun). broth base soup made with shrimp, scallops, halibut, perch, and lots of vegetables. very tasty and healthy. jumbo shrimp and chicken breast grilled and served over a medley of fresh vegetables. marinated, charbroiled chicken breast served over a medley of fresh vegetables. 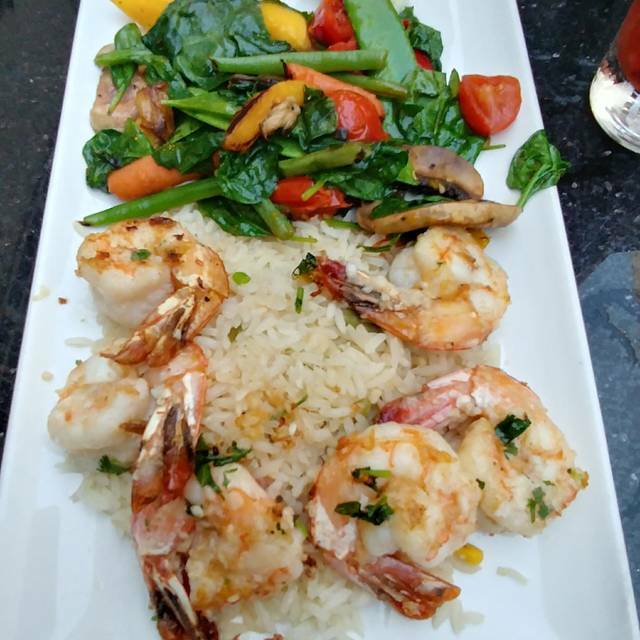 jumbo shrimp marinated, grilled and served over a medley of fresh vegetable. grilled salmon, marinated, tossed with chimichurri sauce and served over fresh romaine lettuce, tomatoes and queso fresco. mesquite grilled chicken breast, covered with creamy sour cream sauce, grilled poblano peppers, sauteed mushrooms, and onions, served with black beans and rice. three crispy corn tortilla shells filled with ground beef or shredded chicken. served with lettuce, tomatoes, cheese, rice and beans. three ground beef or shredded chicken tostadas, each served with lettuce, queso fresco, sour cream. three chicken flautas with sour cream sauce on top. served with lettuce, fresh guacamole, rice and beans. on big burrito made with homemade flour tortillas, stuffed with shredded chicken or ground beef, with cheese and chile con queso on the side. served with lettuce, guacamole, rice and beans. a large homemade flour tortilla folded and filled with shredded chicken or ground beef, chicken or beef fajita meat with chile con queso on top. served with lettuce, fresh guacamole, rice and beans. beef fajita taco, 1 chicken enchilada, 1 beef crispy taco, chile con queso, rice and beans. spinach chicken quesadilla, 1 chicken tostada, 1 beef enchilada, chile con queso, rice and beans. served with rice and beans sour cream chicken enchiladas - three chicken enchiladas topped with sour cream sauce. three chicken enchiladas topped with green tomatillo sauce. three spinach enchiladas topped with green tomatillo sauce and monterey jack cheese. three chicken enchiladas in our traditional red sauce with melted cheese. 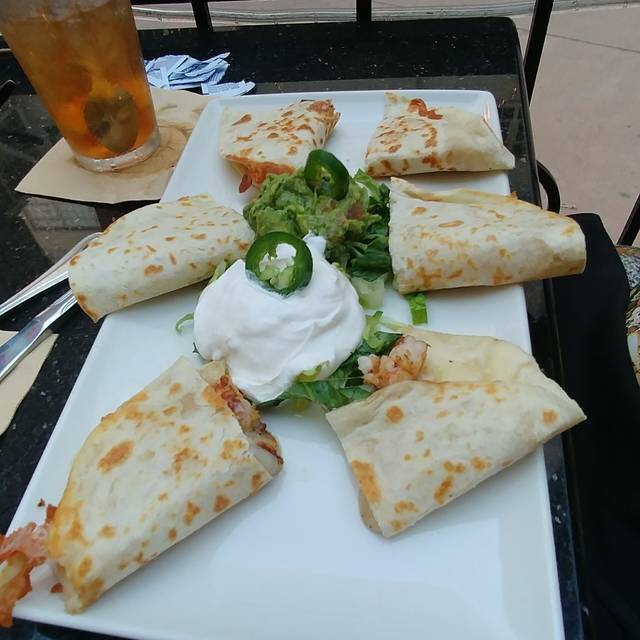 all quesadillas prepared with wisconsin monterey jack cheese and flour tortillas, served with sour cream and guacamole spinach chicken quesadillas. 1served with guacamole, grated cheese and sour cream. el salvador is a fascinating country located in the heart of central america. its people, taking advantage of the tropical scenery and abundant vegetation, delight their palates with native foods. it is our desire to capture such an experience in our food. we have explained some of our unique items; however, words cannot embrace their taste, so we encourage you to try them. a tropical root, with a texture like yams or acorn squash. it has a mild flavor that is complemented by seasonings. va hand-made tamale, wrapped and steamed in fresh banana leaves, gently spiced and filled with chicken, chunks of potato, sweet peppers and tiny bits of tomatoes. Food was delicious and so was the new skinny margarita! Carlos took great care of us during our "long" lunch! Interesting food choices, great swirl margarita. It's a bit loud so I don't recommend for a romantic dinner but we enjoyed it and were surprised that the cost was so moderate. Very busy and loud place on a Friday night. But, food and service is quality every single time. We will return again. Have been several times. Very consistent. Service was good, diverse menu, happy hour everything on Saturday afternoon. We liked it. I do not like to leave bad reviews. But in this case they earned the one star and it's only because the food was delicious. But a good tasting meal does not make up for the horrendous customer service and management that they presented my friends and family on our visit. I read yelps reviews before picking a place to celebrate a birthday dinner, and Gloria's was great and made a reservation on open table. All my party arrives 10 min before our reservation time and check in. Was given a buzzer and said they would get our table ready, 10 min no contact I check back with the hostess, she says just 5 more minutes, come 7:30pm we are taken to patio tables and chairs that were brought in from the outside and sat in the middle of the walkway inside the restaurant where we were in everyone's way and constantly bumped by people trying to walk through. Our waiter arrives and quickly rushes us to order our drinks, I try to talk with him, he quickly states he's very busy. Downhill from then on, he brings our drinks comes behind each person and doesn't even acknowledge himself just puts down drinks food etc. Does not check with us if we needed additional drinks or food. Rushed rushed rushed. I finally had enough asked to speak to a manger explained we did not want anything free. Just wanted it to be known what an awful experience. He simply states they made the patio table for us to "accommodate us" why I'm not sure is how accommodating it was for us when I made reservations days ahead! Instead of apologizing and acknowledging the issues, he made me feel like we were the hassle. So very disappointing and will not be spending our money there again. First, I love Gloria's, food and atmosphere are spot on. When I said I had a reservation the hostess looked clueless and said there were no reservations on her list. It really did not matter since there were plenty of places to sit. However, I do find it ironic that I am receiving a request for a review. I did not know this was a chain restaurant when I originally booked it, but that does explain a lot of the problems. They seem to have spent all their money on the decor, which is nice, and then the accountants at head office said, "Right, now everything else has to be as cheap as possible, including the food." Between us, my wife and I tried the Ceviche, Black Bean soup, Grilled Jumbo Shrimp (Camarones a La Plancha) and the Surf and Turf. None of it was tasty, except for the vegetables that came with the Jumbo Shrimp. The "sirloin" steak in the Surf & Turf was particularly tough and gristly, despite being cooked medium rare, and the "seasoned" Jumbo Shrimp had not been seasoned at all, so my wife had to ask for something with which to flavor them. At first, I thought the service was good, as our waiter was very attentive. But he turned out to be too attentive, asking us if everything was OK or if we needed something literally every five minutes. The young man was trying to do what he thought was good, so that is a management issue regarding training. The owners will probably counter that the prices are not expensive, so that's why things are like this. But Chili's, Applebees, TGIF, et al. all charge about the same, and their food is usually good, if not great. Gloria's looks more like a "real" restaurant than any of these, but what good is that if the food is so bad? Our family went to Gloria's for our daughter's birthday celebration before we went to the Bass Performance Hall for School of Rock. The service was wonderfully attentive and the food was delicious as always. It was a great way to celebrate! Made reservations in advance and although I understand that we could not be given a table at that time, We waited an hour and were placed at the bottom of the list instead of being worked in for a table of 6. We were not acknowledged at all. Ended up having to leave due to it being a special occasion. Too loud. Very hard to carry in a conversation..
We go to Gloria’s often. They always get us seated quickly, which we love! The food and margaritas are great. Highly recommend! Great food but very loud! Absolutely the Bedt Gloria’s we have experienced. Service and food was superb! We arrived on time for dinner. The ladies at the front desk asked us to wait for two minutes. 20 minutes after arrival we were asked to wait for five more minutes. Finally We left after 35 minuets. They don’t seem to care for the reservation that we made. They didn’t seem to apologize for not honoring our reservation. I think the owners of the restaurant need to train their employees to tell the truth to their customers. I have been using open table for some time. This is my fist negative experience and bad review. Had a wonderful time. Wait staff was always around never had to find them. Food was hot and good. Drinks were delicious as well. As always, the food at Gloria’s is superb. The flavors are fresh and the balance is exquisite. I recommend this to anyone. We keep going back! Their black bean dip (free) and salsa are beyond great! Love their tostados. Their portions are great! Restaurant is nestled in among shopping! !Great meal, Experience could not have been better! Valentine’s Day dinner with my girlfriend. First time we had eaten at Gloria's. We enjoyed it very much. The waiter was exceptional and understanding. Will certainly return. Great service. Great food. Thanks for accommodating our big party! Great food and service. Best Latin cuisine bar none. Great time with Friends. Excellent service and the manager checked in on us several times to make sure all was well. Great service. Didn’t like the spinach enchiladas. Went for a friend's birthday dinner with 7 of us and was absolutely fantastic! The food and drinks were both so great and everyone loved it! Enjoyed our food. The chips and salsa were great. My chimichanga was quite good, but i did wonder if the cheese on it was Velveeta. Everyone else liked their meal. prices were ok but a bit on the high side. Lovely server. Had family in from out of town, and wanted to introduce them to a different cuisine, and they loved it! They couldn't stop talking about how great the food was. Good lunch dining experience - food was very good, noise level was moderate, service was attentive and responsive. Good selection of Salvadoran food also of fusion food. Everything was great, BUT they say they don't take reservations on Fridays & Saturdays so they did not honor my Open Table reservation! Good food. Good service. Always fun. Waiter and manager were tops. Since we were celebrating birthdays, we expected a complimentary dessert, though. Side note- this restaurant is in Fort Worth and I live in Fort Worth. Open Table knows nothing about geography and will list me as Dallas. Sorry, folks. Open Table has a lot to learn. Good food, love the bean dip! Very nice location for a weekday lunch. Fast service but still maintained a good sized menu for the lunch hour. Great service and food! Our waiter was friendly and attentive. Will definitely go back. Be cautious informing anyone your there for a birthday. I was brought a $9 piece of chocolate flan and charged for it without ever being told it wasn't complementary for my birthday. I found out when I was given my check.